Standard Golf has named Lind Hunemuller as its national sales manager. Hunemuller, who has been with the company since 2011, will replace Steve Tyler, who will be retiring. Tyler will continue to serve the company as a sales consultant. Hunemuller previous worked in sales with Texas-based BSN Sports before joining Standard Golf. Courtney Young, CGCS at Ansley Golf Club was named the Georgia GCSA Superintendent of the Year. 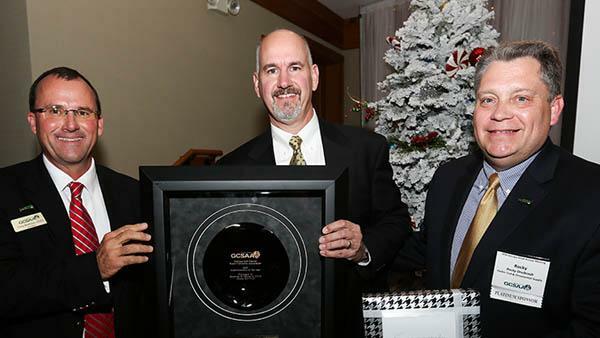 Young, who has been at the 36-hole club since its Settindown Creek course opened in 1988, received the award at the association's annual banquet on Dec. 12. He was just one of several superintendents honored during the event. Billy Fuller and the late George Kozelnicky were inducted in the Georgia GCSA Hall of Fame. Fuller is a former superintendent at Augusta National Golf Club and now principal of his own golf course design firm. He also is the inventor of Better Billy Bunkers. Kozelnicky was a professor at the University of Georgia and Georgia GCSA executive secretary for more than 20 years. He is a member of the Georgia Golf Hall of Fame and a recipient of GCSAA's Distinguished Service Award. Also receiving awards during the event were Anthony Williams, CGCS, formerly of Stone Mountain Golf Club, who received the chapter's Distinguished Service Award, Philip Soukup of The Landings Club, who won the Assistant Superintendent of the Year award; Aaron Saunders from Jekyll Island Golf Resort on Jekyll Island received the Environmental Leader in Golf Award; L.J. Robinson from Cherokee Town and Country Club in Atlanta won the Golden Pen Award for the best superintendent written article of the year for his piece Drones Give Superintendents Their Own Eye In The Sky. In other news, Wally Gresham from Sunset Hills Country Club in Carrollton was elected to the chapter's board of directors. Anuvia Plant Nutrients will be a distributor of GreenTRX 16-1-2-17S-3Fe, a plant-nutrient product produced by The Andersons. Anuvia's sales team in Florida will be representing Anuvia in the Florida golf, sports turf and lawn and landscape markets. Anuvia began commercial production earlier this year at its new facility in Zellwood, Florida. The company's processing system uses organic materials to create enhanced efficiency plant nutrient products.